Has the Crook Cigar Gone Extinct? (From "The city of Louisville and a glimpse of Kentucky" by Young Ewing Allison, 1887.) 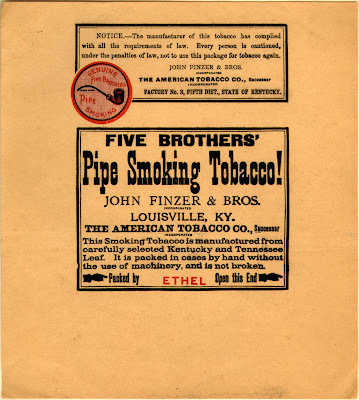 - THE Five Brothers Tobacco Works, John Finzer & Bros., proprietors, is by far the largest tobacco factory in Louisville, and ranks fifth in importance in the United States. The business was started in 1866 by the five Finzer brothers, whose names were John, Benjamin, Frederick, Rudolph, and Nicholas. They were all born in the Canton Berne, Switzerland, and came to this country as mere lads. They were all marked with the best traits of the sterling Swiss character, being men of high integrity, great energy, determination, and intelligence. As boys they learned the trade of manufacturing plug tobacco and worked in nearly all the factories operated here. Their admirable qualities soon gained them the friendship of many of the business men of the city and started them upon the career of prosperity that they have followed through life. One of the brothers, Benjamin, died in 1875; Frederick died in 1883. Rudolph Finzer withdrew from the firm in 1882, so that of the five brothers John and Nicholas are the only two left in the company. The factory was started on a small scale, but the superior quality of the goods offered by the firm soon attracted general attention and the works had to be enlarged in order to supply the demand. In four years the Finzers had built up a trade that gave them the leading position among the tobacco manufacturers of this city, which position they have maintained ever since. In fact, since 1870, they have made a third of all the plug tobacco manufactured in this market. For the month of August, 1887, the tax on tobacco paid by all the Louisville manufacturers was $96,931.90. Of this amount Finzer brothers paid $39,421.00, or considerably more than one-third. In 1882 the company was incorporated. Its officers now are John Finzer, President ; Nicholas Finzer, Secretary and Treasurer; M. Leopold, Vice-President; D. A. Keller, Assistant Secretary and Treasurer. The capital stock of the company is $200,000. The company manufactures 4,000,000 pounds of plug tobacco annually, and about 1,000,000 pounds of smoking tobacco. Its trade in the Eastern States is larger than that of any other tobacco factory in the West. It has a capacity of 20,000 pounds of plug and 5,000 pounds of smoking tobacco a day. The company employs from eight to a dozen traveling men, and covers the entire territory north of the Ohio river and as far west as Colorado. Its pay-roll averages 400 hands the year around. The capacity is increased every year. The factory was destroyed by fire in 1880, the loss being $200,000, only partially covered by insurance. This disaster would have proved fatal to men of less energy ; but was only a spur to these gentlemen to make greater efforts. They rented a factory in the lower part of the city and had their hands at work within thirty days after the fire. They rebuilt the factory on the old site, and on September 10, 1882, two years to the day from the date of the fire, they raised steam in the new works. The buildings were more perfect than the old could have been made. They are situated on the south-west corner of Jacob and Jackson streets and run back to Laurel street, having a frontage of 175 feet on the south side of Jacob street. Here are the main buildings, the plug factory, the smoking tobacco factory, the packing house, and the offices. On the north side of Jacob street the company owns 185 feet running back to an alley. On this ground are a new warehouse, re-drying rooms, chunk shops, etc. There is a boiler on each side of the street, and the steam may be conducted from either boiler into any of the buildings. The company has the advantage that every factory located in Louisville has—the opportunity to buy tobacco in the home market, which is the largest tobacco market in the world. Almost the entire out-put of the factory is made from the Burley leaf. The leading brand made by this company is "Old Honesty," a standard, sixteen-ounce plug of navy tobacco. It has been on the market nine years, and is the brand on which the firm made its greatest reputation. It has never varied in quality, being as good to-day as it was when it first appeared upon the market. The other leading brands are "Jolly Tar," which gained its popularity because of its being the largest plug of tobacco ever offered for the money, quality considered; the "Five Brothers," an extra fancy brand, and the "Pastime," which is the same. The last two are the only brands issued to the trade in tin packages, and have made a great success on that account. They are guaranteed to be the best tobacco that can be manufactured at any price. The leading brands of smoking tobacco are the "Five Brothers Pipe Smoking," and a mixed plug' smoking tobacco. The former is largely consumed by the miners in Pennsylvania and Ohio. The company publishes an excellent trade paper, The Tobacconist, which has a guaranteed monthly circulation of 32,000 copies. It contains good selections of reading matter, and valuable information for the retail dealer. Thanks for the correction. I deleted the photo in question. If you are asking about the John Finzer Pipe Smoking Tobacco package, here is what I have learned: in the early 1900's, The American Tobacco Company took over, by aquisition, I suppose, the Five Brothers Tobacco Company of Louisville, KY. After a few years of anti-trust suits filed by the US government, the aquisition was completed. The package shown above, says "American Tobacco Company, Successor". This places the date of this package after 1911. This brand was continued by the ATC for decades. This is why there are many of these packages in existence today, in like new condition. The Old Honesty sign is for a brand of plug tobacco that they manufactured. Thank you posting the history of Five Brothers Tobacco Company. We had a building in town that was built in 1881. It had a huge 5BTC ad on the side that was barely visible. I always wondered about the details. I am the great great grandaughter of David Finzer from the Ohio line of the Finzer family. Is anyone a direct descendant of the 5 Brothers Finzer? I am the great grandson of John Finzer, President of Five Brothers Tobacco Co, Louisville, KY. I believe the Ohio family of FInzers are those who were in the brick business. I have not found a direct connection to the Louisville family. The common ancestor may have never immigrated from Germany/Switzerland. My John Finzer immigrated from Bern, Switzerland around 1850. My father says our family is related to the Five Brothers. My grandfather, James Finzer was from Louisville. How can I find out for sure? My Grandfather was from Louisville.Also named James Finzer. How would I know if I'm related to the Five Brothers or not? COntact me at RoyRowlett@earthlink.net and I will help you with the connection to the Finzers.